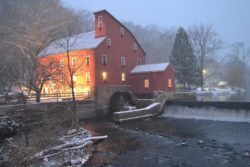 The Friendly Sons of St. Patrick of Hunterdon County is a 501(c)3 charitable organization that aims to promote, embrace and enjoy Irish-American culture in a positive and progressive manner. Founded in 2008, the FSSP also raises and distributes funds to families impacted by medical bills, assists children with disabilities and supports Non-Profit Organizations that benefit people in need. The FSSP has raised and distributed more than $250,000 to worthy causes across Hunterdon Co over the past 10 years. The FSSP always welcomes new members and holds monthly meetings on the 2nd Tuesday of each month at the Clinton Elks, 201 Sidney Rd, Pittstown, NJ 08867 at 8:00 PM. 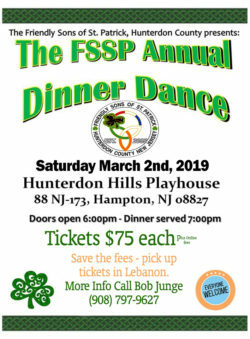 For more information on membership or philanthropic support, contact FSSPHunterdon@gmail.com. We would love to share more of our vision and accomplishments with you. It should make you confident in our efforts. The Sons support many worthy community centers. This includes help with renovation, supplies, and maintenance. 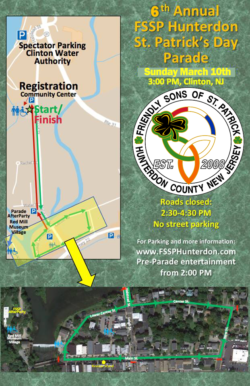 Welcome to the new look of The Friendly Sons Of St. Patrick Hunterdon. We are trying to make upcoming events and accomplishments easier to discover. Sunday March 10 Downtown Clinton 3pm. Several thousand residents enjoy this parade every year!